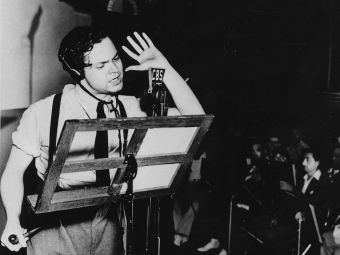 In this special from Radiolab, we take a deep dive into one of the most controversial moments in broadcasting history: Orson Welles’ 1938 radio play about Martians invading New Jersey. Why did it fool people then? And why has it continued to fool people since? From Santiago, Chile to Buffalo, New York to a particularly disastrous evening in Quito, Ecuador. When Orson Welles decided to make a radio play of the H.G. Well’s classic, "War of the Worlds," he had no idea that he would be branded by the FCC as a "radio terrorist." The audience reaction – panic on a mass level never before witnessed – isn’t just a testament to Welles talent for gripping drama, it’s also a reflection of that moment in history. We take a close look at the way that the evolving news media collaborated with the events in Europe to prime the pump. Could It Happen Again? (And Again?) We take an in depth look at a War of the Worlds radio play incident with even more dire consequences. Help us roast 2012 to a crisp with The Capitol Steps and their annual year-in-review awards ceremony called "Politics Takes a Holiday!"